I am experienced with editing fiction and non-fiction. 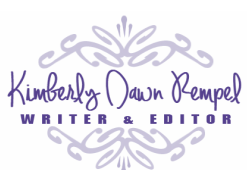 I've edited novels, e-books, presentations, articles, biographies and more. My clients have been greatly pleased, and I'm sure you will be too! All edits are done using Microsoft Track Changes. You will receive a thorough proofread for grammar, spelling, punctuation. This step is critical for pre-publication, and highly advised for all professionally edited manuscripts. If this is the first edit your manuscript is receiving, I do not recommend starting with this. Instead, I'd recommend a minimum once-over using the following Full Edit & Directional Notes package. You will receive a thorough copy edit for grammar, spelling, punctuation and general sentence structure. I will also provide a full stylistic edit (clarify meaning, eliminate jargon, and polish language) Instead of rewriting and reorganizing (as with the next package), directional notes will be made. This is recommended for a fairly clean manuscript. You will receive the same thoroughness as with the full edit (above), and also the re-working, re-organization, and rewriting of your draft as needed. Once I'm through, all you need do is review and approve changes. This service is ideal for the writer who has finished draft two or three, and cannot stand to read it again. This service is also ideal for the busy individual who does not have time for re-working and re-writing, and who would rather have a capable helper finish the job. Pricing varies, depending on genre, depth of research required, and length. Prices start at $40 per article. Let's talk about it! Ever wanted to write a book, but were not sure of how to start? Ever wished someone would just write the thing for you? Not only can I ghost write your story in a way that people will think you wrote it yourself, but I can also help you discover your story. Prices start at $0.30 per word. Please contact me to discuss. I would love to create an ebook for your business! Compile your knowledge and expertise into a valuable product your customers want. Prices vary depending on length and depth of research required. Prices start at $0.30 per word. Don't worry, it's easier than you think! 2. After we've figured out the basic idea for your awesome new book, I will send you a draft outline to approve. 3. Once I have an approved outline, off I go to write your book. Then I send you the first draft and see what you think. 4. After the first draft is tweaked (according to your feedback), I shine it up and we do it again until you're fully satisified with your new e-book. Need an experienced Facebook marketer? I can help increase your online presence and web traffic by developing your Facebook presence. Wondering how to get your writing in front of others? I've helped clients increase their web traffic and get their face, name, and words in front of tens of thousands of people (no public speaking required!) This is absolutely possible for you too! How to get your words in front of tens of thousands of people - for free, or even for pay! ​Ready to get some attention? ﻿This is the what & how of your content marketing strategy. *For projects of $400+ a 20% deposit will be required.